WSU linebacker Peyton Pelluer’s father, grandfather and great-grandfather also played for the Cougars. But when it comes to the Apple Cup, it was a little more complicated than that. When Washington State linebacker Peyton Pelluer walks onto the field at Husky Stadium on Friday, he’ll be channeling generations of Pelluers before him. Peyton Pelluer is the youngest son of Scott Pelluer, who played linebacker for Washington State from 1977-80, the grandson of the late John Pelluer, who played end for WSU from 1953-55, and the great grandson of Carl Gustafson, a fullback for the Cougars from 1925-27. Gustafson was Scott’s maternal grandfather. But there’s more. Peyton is the younger brother of Cooper Pelluer, who was a linebacker for the Huskies from 2010-13, and the nephew of Steve Pelluer, who quarterbacked UW to a Pac-10 title and a win in the 1982 Rose Bowl. Family ties: Father, Scott, played linebacker for WSU from 1977-80; grandfather, Arnie, played end for WSU from 1953-55; great-grandfather, Carl Gustafson, played flanker for WSU from 1925-27. Brother Cooper played linebacker at UW from 2010-13; uncle Steve was a UW quarterback from 1980-83. When Peyton Pelluer says he’s understands exactly what the Apple Cup means to UW and WSU fans, he’s not kidding. You have to go back to 1954 to find the last time a Washington State team beat the Huskies with a Pelluer on the roster. The Cougars went 2-1 against UW when John Pelluer was on the team. Collectively, the men of the Pelluer bloodline who have played for the Cougs have a 3-9 all-time record against their in-state rival. To this day, Scott still rues the fact that he went 0-4 against the Huskies during his time with the Cougars, and Peyton is 0-1 so far – he also redshirted in 2013, when UW beat WSU, 27-17. “I know what the rivalry is about,” Peyton Pelluer says. “There’s some guys who come here from California or Florida, and they don’t know what the rivalry is about until their first game, that first Apple Cup, and it kinda clicks for them. It was just a winding road to get to this point. Even though Scott and Kim Pelluer are WSU alums – Kim was a Cougars cheerleader – and they tried to instill that Cougar pride in their four children (Tyler, 27; Jordan, 25; Cooper, 22 and Peyton, 20), Scott’s vocation as a college football coach undermined their efforts for many years. In between stops in Boise, Flagstaff, Ariz. and Tucson, Ariz., Scott served two stints as an assistant for UW in the late 90s and early 2000s, and consequently, the Pelluer kids grew up UW fans, running around the Huskies’ football facilities decked in purple clothes. 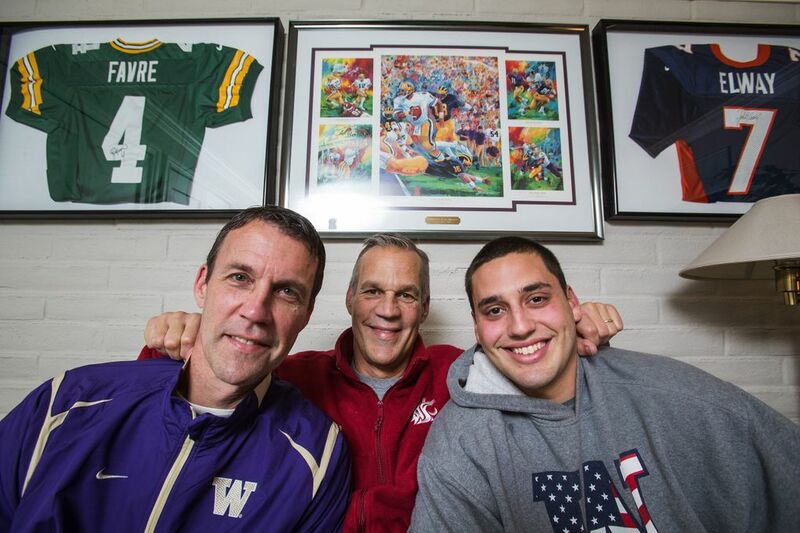 Jordan and Cooper are UW alums, while Tyler played linebacker for Montana. So when it came time for their youngest child to navigate the recruiting gauntlet, the Pelluers were excited when the Cougars offered Peyton a scholarship. “We finally got ourselves a little Coug,” says Kim, who, as the Coug wife of a Husky football coach, repressed her school spirit on numerous occasions throughout the years. Like in 1997, when the Cougars rolled into Seattle with Ryan Leaf at quarterback and pulled out a 41-35 win over UW to earn a berth to the Rose Bowl. After years of repressing their Cougar ties through Scott’s UW coaching career and Cooper’s time with the UW football team, Kim and Scott returned to the Cougars’ side of the stands to cheer on Peyton in last year’s Apple Cup in Pullman. WSU lost, 31-13, but it was nonetheless a fulfilling experience for the Pelluers. Peyton had beaten out an upperclassman midseason to earn the starting mike linebacker job as a redshirt freshman, and he finished with eight tackles and a sack. The passion for football was slow to develop for Peyton, however. Unlike his brothers, who both took to football from the earliest possible moment they were allowed to play, Peyton started out ambivalent to the sport that had captivated generations of Pelluer men. Unusual, especially when you consider that the youngest Pelluer boy was named after a future Hall-of-Fame quarterback. Scott got to know Archie Manning when they played together on the New Orleans Saints from 1981-86, and he and Kim named their sons Cooper and Peyton after two of the three Manning boys because “I just loved their names,” Kim says. The Pelluers recall one game from when Peyton was about 9 or 10, in which he played defensive end and had multiple sacks. Each time Peyton got to the quarterback, his name rang out over the stadium’s loudspeakers. 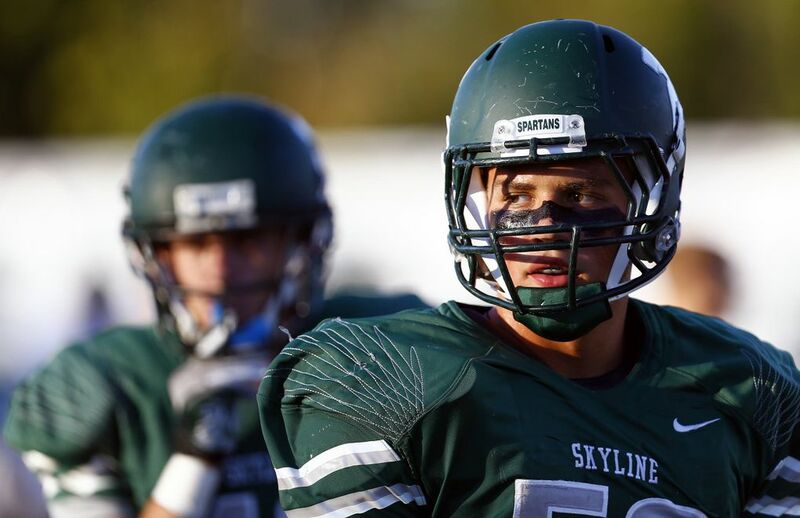 In time, Sammamish’s most reluctant football player would develop into a conscientious, cerebral linebacker who starred at Skyline High School and counted effort as the best remedy for everything. When it came time to pick a college, Peyton had a wealth of options. Arizona State, Colorado, Colorado State and Oregon State were on the list. But perhaps because of his bloodlines, Washington State was always the front-runner. Peyton was about 4 years old the first time the Pelluers took him to Pullman, and the visit struck a chord with the boy. “Wow, we’re in Cougar world,” he gasped in awe, taking in the Cougar flags flying from lampposts and the Cougar head logo painted on the streets. Even though he spent more time at Husky Stadium than he did at Martin Stadium during his youth, some of that boyish awe returned when Peyton went on his official recruiting visit to Pullman with his father. “Once I grew up and realized that I had the chance to be the only member of my family out of my three siblings to be a Cougar, it was kinda like I belonged there. It was my place,” Peyton says. 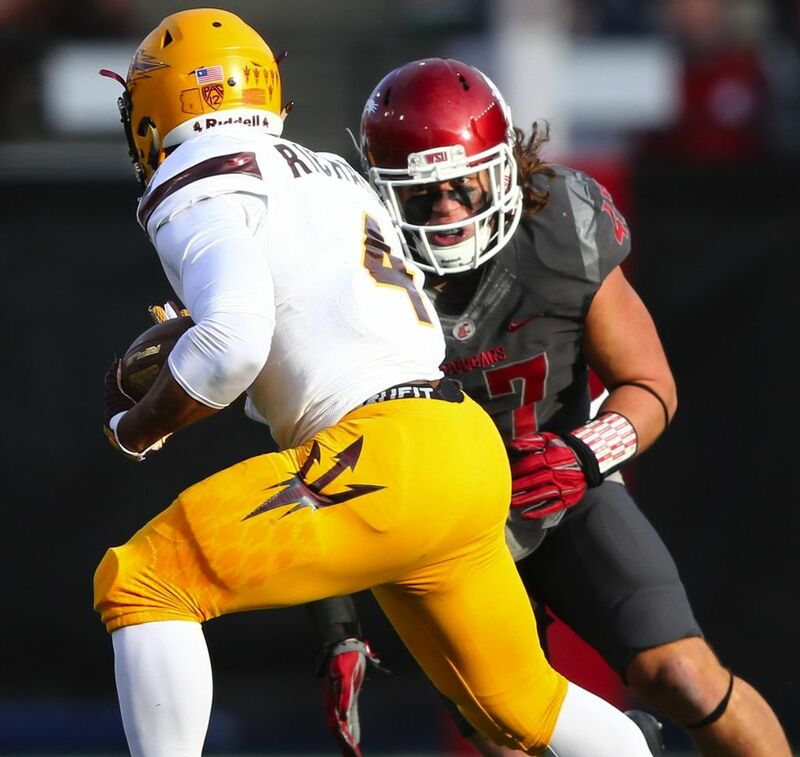 Now in his second season as the starting mike linebacker, Peyton has established himself as one of the main components of an up-and-coming Cougar defense that’s been a huge part of WSU’s success this season. 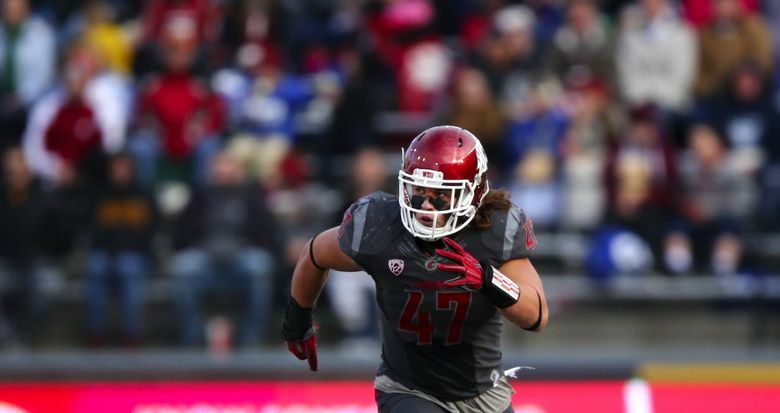 “I think he’s one of the best examples we have out there,” said WSU coach Mike Leach. “Everyone admires a guy who’s kinda been an overachiever, but an overachiever who’s steadily improved his play to the point where, of course, he makes the calls and things, but I think his whole thing is really inspiring. Peyton leads the defense with 87 total tackles, and is second to Darryl Paulo with 10 tackles for loss on the season. These days, the Pelluers are enjoying their re-entry into “Cougar world.” Kim and Scott are at every home game, where they leisurely meander their way through the tailgate lot, saying hello to old friends and reconnecting with former teammates. Ranked 20th, their highest ranking since 2003, the Cougars (8-3) are riding a three-game win streak into their Apple Cup showdown with the Huskies at Husky Stadium. With everyone back on the Washington State side of the rivalry — yes, the whole family will be rooting for Peyton and the Cougars because, as Scott says, “blood is stronger than schools, you know?” — the Pelluers are hoping this is finally the year they get that long-awaited WSU win over UW. “I’m expecting that the Huskies are just going to totally bring it, because what do they have to lose,” Kim Pelluer said. “That’s the mindset of the Apple Cup. It makes your whole year to win that game.